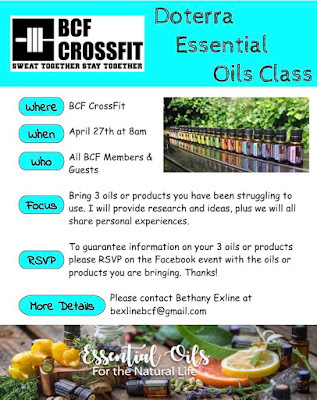 I am super excited about our next BCF's Doterra Essential Oils class! Thanks to Tonya's awesome idea we are going to bring 3 oils or products you have been struggling to use. At our meeting I will provide you with research and ideas, plus we will all share personal experiences. It is EXTREMELY important that you RSVP and comment in the Event with a post of which oils or products you will be bringing. That way I can be prepared with information JUST FOR YOU and the group!! If at all possible please post your oils by April 20th. If you're new to essential oils and just want to come join, relax, socialize, and listen you are ALWAYS welcome! You don't need to stress or bring anything but your fabulous self!